New theater company Dark & Stormy Productions is really hitting their stride; they've become one of those theater companies that I rely on to never let me down. Their fourth production in just under two years continues their tradition of short, intense, real, small-cast, smartly written plays in unusual locations. 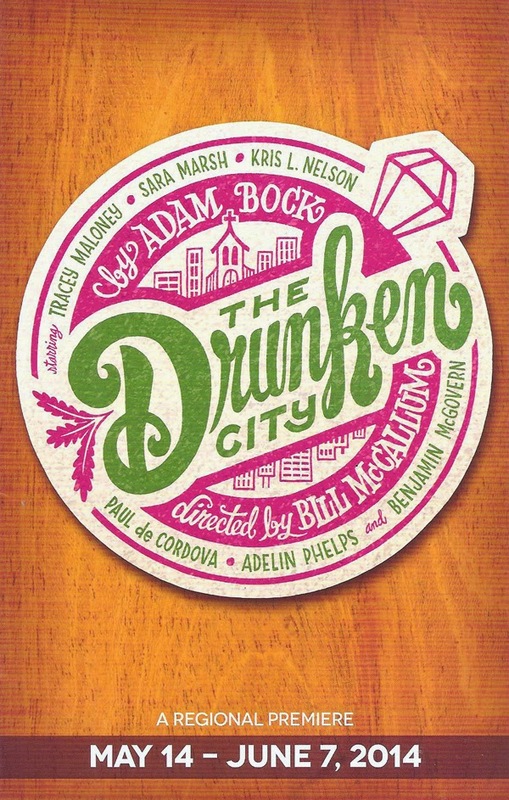 Drunken City (written by Adam Bock, the same playwright as their last show, the hilarious dark comedy The Receptionist) introduces us to three recently engaged girlfriends out for a wild night in the city. The seemingly innocent good time turns into more as the three women, and the men that they meet, ponder life and relationships, and whether or not they are where they want to be in both. Spend 75 minutes with this fantastic cast (directed by Associate Artistic Director Bill McCallum, who's more often seen on stage) for a fun, entertaining, and surprisingly deep night at the theater. As they explain to the audience in the opening scene of the play, Marnie (Sara Marsh, founder and Artistic Director), Linda (Tracey Maloney), and Melissa (Adelin Phelps) have all recently gotten engaged. They have a history of destructive nights of drinking "in the city" (Linda drinks too much), but that doesn't stop them from going back again to celebrate Marnie's bachelorette party. They predictably drink too much (Linda couldn't resist the pretty pink drinks) and run into a couple of guys from their town, Eddie (Paul de Cordova) and Frank (Kris L. Nelson). Marnie promptly begins kissing Frank, much to her friends' dismay. Marnie's not sure she wants to get married after all, and Melissa and Linda have their own reasons for insisting that she does, reasons that are more about them and their insecurities than they are about Marnie and what's right for her. The girls call their reliable friend Bob (Benjamin McGovern) to come and help them get Marnie home and away from Frank. As the six characters wander through the streets of the drunken city, we learn a little about each of them in conversations and short monologues. This is where the surprisingly deep part comes in, as their hopes, fears, and dreams about their lives and relationships echo our own. It's truly a joy to watch this cast perform this smart and funny play, playing characters that seem familiar from our own lives. 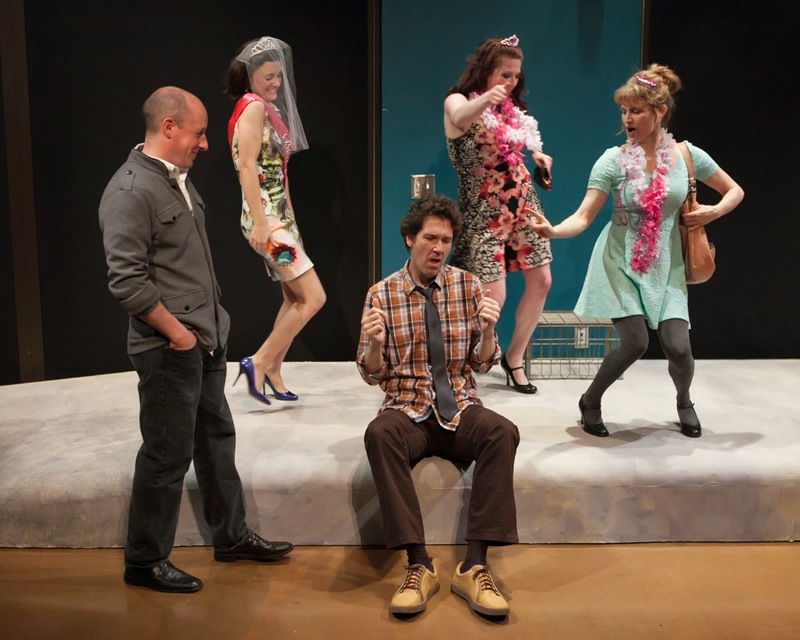 They're all so wonderful and funny, partly because most of them play drunk for most of the play, and do it well. But also because they bring depth to these characters and make them more than what they first appear - Sara as the runaway bride in over her head, Tracey as the woman who drinks too much to mask her deep fears about life, Adelin as the tough-talking friend who insists that Marnie's marriage work out because hers didn't, Kris as the sad-sack Frank who so sweetly listens to Marnie, Paul as Frank's hilariously mumbling friend Eddie, and Benjamin as everyone's best friend who opens up and learns a thing or two about love. All of these characters are changed by this one drunken night, for better or worse. The play takes place in a cool, modern, brightly-colored theater space in the Lyric at Carleton Place, a new apartment complex on University in St. Paul (with free parking across the street). Make a date to spend a night with these six friends before the party ends on June 7 (drunkenness optional).